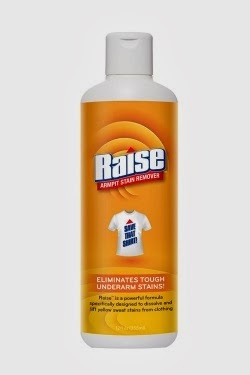 Have you heard of Raise Armpit Stain Remover?? Well if not your missing out. Do you know someone who gets armpit stains but not only under arm stains this gets rid of ring around the collar too which is good because my dad gets that bad. This product is best used by pre treating the entire stain, rubbing together (or using a small brush) and letting it sit for 15-20 minutes before laundering. 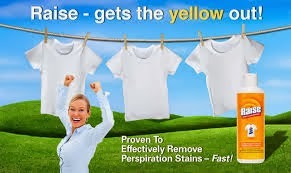 RAISE can be used on colored clothing however you must spot test for colorfastness. If you have treated your armpit stains with bleach the stain is permanent and unsalvageable. Test RAISE on stains that have not been treated with bleach. I really like and will continue to use it for both ring around the collar and underarm stains.